The problem I continue to see in my coaching and consulting with runners is when time goals are selected that aren’t based on current fitness, actual training adaptation or performances along the way. Sometimes the number becomes a means to motivate and may not match your fitness. That doesn’t mean you can’t set a time goal and achieve it, but it should always start with developing a base—finishing your first race at a given distance, then using that as a means to improve and progress little by little. If you set out to cut 50 minutes off your marathon time to break 4 hours, you are basing your goals on numbers rather than reality. Instead, you could set a goal to improve performance and cut a smaller chunk of time—say 10 minutes—and continue to evolve as you go. That is how elite runners train and perform—from high school, to college, to a professional career, these runners improve like a fine wine, in time. Jenny Hadfield, January 24, 2013. This is the same challenge I see with people trying to deliver projects on time with good quality. They currently never deliver projects on time but in order to finally deliver, they conclude they must move faster. Instead, I have them pull up their data from their last 3-5 projects and find the average. Yes, it is an average for projects that were late, but it still represents a time they actually achieved in finishing a project. Once they deliver on time, using their past historical pace, then we talk about getting faster. In fact, it doesn’t require much talk as most organizations I worked with naturally got faster once they finally admitted how long it was taking and set their pace by that number. I just attempted my 2nd marathon. My first marathon I ran on a sprained ankle because I just didn’t want to not run after doing all that training. It was painful and I walked/ran the last few miles to finish the marathon. 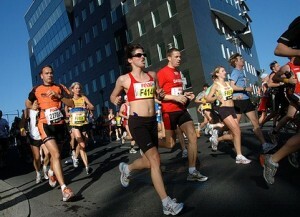 This marathon my training went well, no sprains or pains and I felt ready for the marathon. It was a wet and stormy day with a threat of the marathon being cancelled. We were drenched from the rain and I felt heavy and my legs felt more tired than I expected them to be at each mile marker. Yet I kept looking at my watch to check my pace and kept “leaning in” to keep the pace to my 11 minutes per mile goal. They shut down the course when I hit the 17 mile marker due to the severity of the weather. I wasn’t as disappointed as I figured I would be as we knew this might happen. Instead I was a bit relieved as I knew I probably couldn’t continue to maintain the pace I was aiming for. This was a hometown marathon that ran close to my house, so my plan was to simply run home if the race was cancelled. It was about three miles to home and so my total mileage would be about 20 miles which I had done regularly in training. However, I couldn’t run it. I ran some and then walked most (in the pouring rain). My knee was on fire and my hips started to complain as I tried to compensate for the knee. It reminded me that I was trying to deliver this running project in a time that in retrospect was not realistic. Even as I realized my pace was not right for the conditions, I pressed on and damaged my “quality” rather than relenting on the pace. My goal should have been to complete the run (in whatever form) but my fixation (ego) on the pace undermined my ability to do so. The good news is that most organizations already have multiple completed projects under their belt. They have a good, if underappreciated, record of what they can do. The trick is to base their projects on this past performance, and then — once they finally deliver on time — work on improving their speed. As I like to remind people, a schedule based upon an average time to deliver a project is an aggressive schedule. It is going to be hard, but with the advantage of knowing that it is doable, because we’ve done it in this timeframe before. I’ve not yet completed a marathon by running it continuously from beginning to end. Once again that will be my goal next year with our local marathon. Realizing that the logic behind my marathon training is so similar to project management made it just seem obvious, once I got it, that I was setting an unrealistic pace. Once again success is not usually complex and we know what to do. We just need to apply the principles with accuracy and gain the benefits. I’ll let you know how I do next year. What are you basing your project schedule estimates on and how is that working out for you?